Often I am accused of being a person who doesn’t like to take risks, heights and motorcycles being at the top of the list. But when it comes to the kitchen, something inside me takes over and there is a brashness that even I sometimes find surprising. Which is why when we had friends over for dinner one evening, I decided to make a dish I had created in my head, but had never made before. On a wing and a prayer, I had my fingers crossed this would be successful, and after three helpings, I think it was! For our vegetarian guests, this was perfect. To boot, I took it one step further (because you just never know), it’s also gluten-free and vegan. 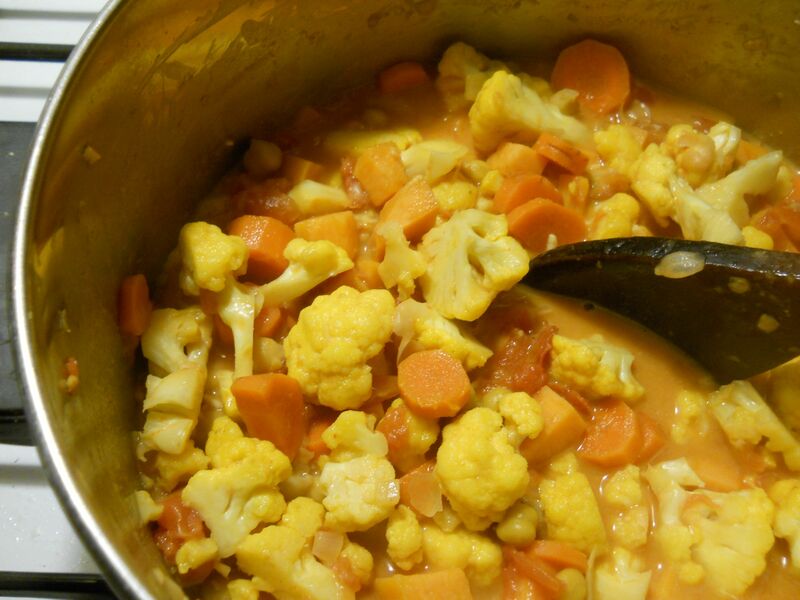 Every season has its veggies and this time of year it’s cauliflower, sweet potatoes, and carrots, among others. I saw the most gorgeous orange cauliflower at the co-op last week and just had to have it. Unfortunately, it was $2.99 a pound, not a head, as I had thought the sign said, but it was worth the money. 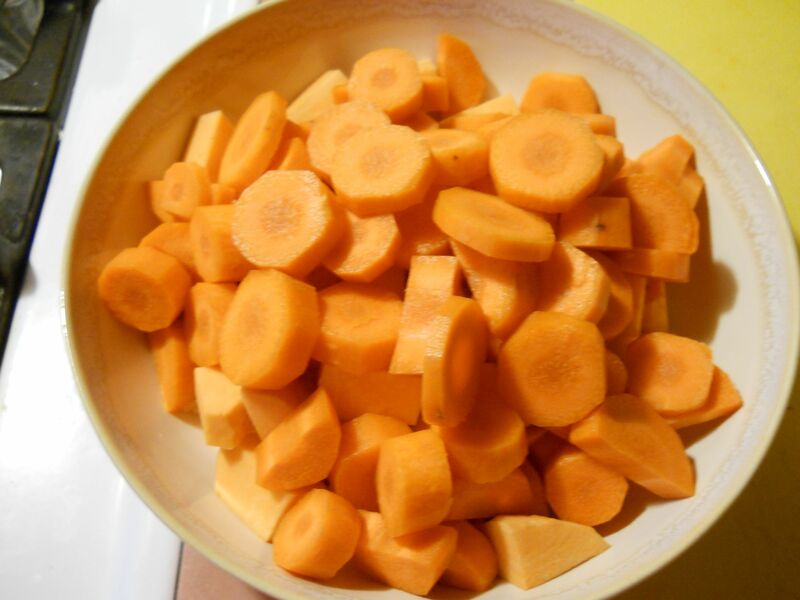 The carrots and sweet potato rounded out the orange-colored vegetables. The carrots and sweet potatoes await. Helpful Kitchen Tip: Instead of ordinary white or brown rice, serve this over basmati or jasmine rice for some extra flavor–or make coconut rice! I just add a little bit of coconut milk to the water when the rice starts to get plump and a couple of tablespoons of shredded coconut when it is done cooking. If you have fresh ginger on hand, a teaspoon or so minced would be fabulous! I love Thai food, so I thought making a mixture of red curry paste and coconut milk would meld well with the veggies, beans, and tomatoes. The warmth of the curry and the slight sweetness of the potatoes complemented each other in a comforting mixture. Served over coconut rice, this was a perfect early fall dish that satisfied veggie and meat eaters alike! I wanted this to be a bit more of a stew, but found the tomatoes didn’t add as much liquid as I had thought. If you want a little more liquid, add a little bit of water until you get the consistency you like. Also, I found this terribly bland; adding some salt to taste made a big difference. 1. In a Dutch oven, heat a little bit of olive oil and saute the garlic and onions until soft, about 3 minutes or so. 2. Add the sweet potatoes and carrots. Cook over medium heat for about 7 minutes. They should be starting to get somewhat soft, but not mushy. 3. Stir in the cauliflower. Add the beans and tomatoes and bring the pot to a low simmer. If need be, add some water if the stew looks dry. 4. In a small bowl, whisk together the coconut milk, soy sauce, and curry paste. Add to the stew and mix. 5. Dinner is ready when the veggies are soft, but still firm. This took about 30 minutes from start to finsih. Serve over rice. Nice warm feeling autumn meal! I was one lucky vegetarian that night. Thank you, Chris. It was delicious! Oh, you’re welcome! 🙂 Any time!